Left: 80 South St, never built. Courtesy of Sciame Development Inc.
After 9/11, the idea of conspicuous height was for a while eclipsed, but the perennial appeal of spectacular views was impossible to suppress for long. In 2004, the builder and developer Frank Sciame commissioned architect and engineer Santiago Calatrava to design a slender tower at 80 South St., just outside of the South Street Seaport historic district boundary. Calatrava conceived a scheme for a 835-foot vertical structure that stacked 12 "townhouses in the sky." With only 175,000 square feet of floor area, the tower was very narrow, with a slenderness ratio of more than 21:1. Each of the superimposed cubes was to be an individual dwelling of multiple floors, with private balconies and rooftop terraces. The design was expensive and failed to find attract enough investors in individual units to find the financing to move forward. Another building, One Madison Park, which has been recently renamed One Madison by its new owner/ developer, employed a similar concept of stacked cubes, differentiated from the dark shaft by white glass and cut into segments that also created wrap-around terraces for some apartments. 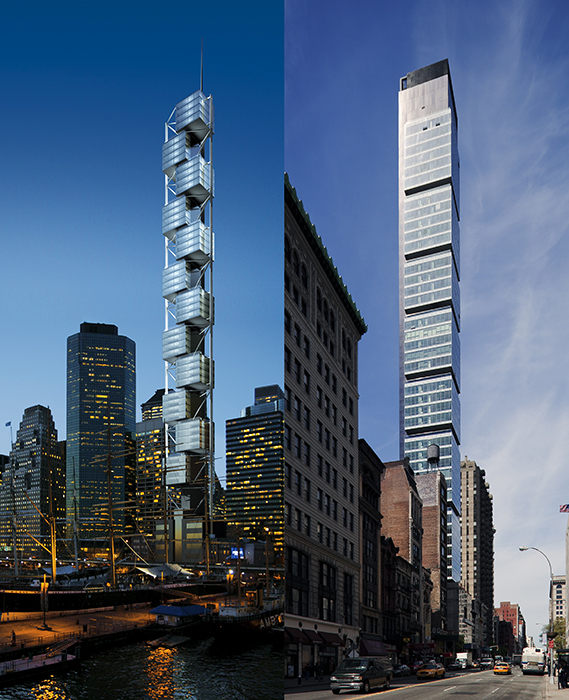 Designed by Cetra Ruddy with structural engineering by WSP Cantor Seinuk, the 50-story tower rose 621 feet tall on a 50-foot lot, producing a slenderness ratio of 1:12. Largely completed in 2009, the project hit the market at the beginning of the recession, and the first developers had to declare bankruptcy and sell the building.